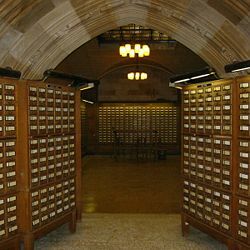 The card catalog at Yale University's Sterling Memorial Library goes almost completely unused, but adds to the austere atmosphere. A library catalog (or library catalogue) is a register of all bibliographic items found in a particular library or group of libraries, such as those belonging to a university system spread out over several geographic locations. A bibliographic item can be any information entity (e.g., books, computer files, graphics, realia, cartographic materials, etc. ), that is considered library material (e.g., a single novel in an anthology), or a group of library materials (e.g., a trilogy), or linked from the catalog (e.g., a webpage) as far as it is relevant to the catalog and to the users of the library. The card catalog was a familiar sight to library users for generations, but it has been effectively replaced by the Online Public Access Catalog (OPAC). 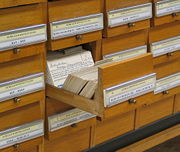 Some still incorrectly refer to the online catalog as a "card catalog." Some libraries with OPAC access still have card catalogs on site, but these are now strictly a secondary resource and are seldom updated. Many of the libraries that have retained their physical card catalog post a sign advising the last year that the card catalog was updated. Some libraries have eliminated their card catalog in favor of the OPAC for the purpose of saving space for other use, such as additional shelving. Another view of the SML card catalog. These objectives can still be recognized in more modern definitions formulated throughout the twentieth century. In 1960/61 Cutter's objectives were revised by Lubetzky and Lubetzky and the Conference on Cataloging Principles (CCP) in Paris. The latest attempt to describe a library catalog's goals and functions was made in 1998 with Functional Requirements for Bibliographic Records (FRBR) which defines four user tasks: find, identify, select, and obtain. Author catalog: a formal catalog, sorted alphabetically according to the authors' or editors' names of the entries. Title catalog: a formal catalog, sorted alphabetically according to the title of the entries. Dictionary catalog: a catalog in which all entries (author, title, subject, series) are interfiled in a single alphabetical order. 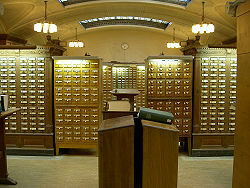 This was the primary form of card catalog in the Anglo-American world just prior to the introduction of the computer-based catalog. Keyword catalog: a subject catalog, sorted alphabetically according to some system of keywords. Mixed alphabetic catalog forms: sometimes, one finds a mixed author/title, or an author/title/keyword catalog. Systematic catalog: a subject catalog, sorted according to some systematic subdivision of subjects. Also called a Classified catalog. Shelf list catalog: a formal catalog with entries sorted in the same order as bibliographic items are shelved. This catalog may also serve as the primary inventory for the library. Library catalogs originated as manuscript lists, arranged by format (folio, quarto, etc.) or in rough alphabetical arrangement by author. Printed catalogs, sometimes called dictionary catalogs enabled scholars to access the contents of a library. These would sometimes be interleaved with blank leaves on which additions could be recorded, or bound as guardbooks in which slips of paper were bound in for new entries. Slips could also be kept loose in cardboard or tin boxes, stored on shelves. The first card catalogs appeared in the nineteenth century, enabling much more flexibility, and towards the end of the twentieth century the OPAC was developed (see below). c. 800: Library catalogues are used in the House of Wisdom and other medieval Islamic libraries where books are organized into specific genres and categories. 1595: Nomenclator of Leiden University Library appears, the first printed catalog of an institutional library. 1674: Thomas Hyde's catalog for the Bodleian Library. More about the early history of library catalogs has been collected in 1956 by Strout. how the entries should be sorted in the catalog. The larger a collection, the more elaborate cataloging rules are needed. Users cannot and do not want to examine hundreds of catalog entries or even dozens of library items to find the one item they need. The most commonly used set of cataloging rules in the English speaking world are the Anglo-American Cataloging Rules, 2nd Edition, or AACR2 for short. In the German-speaking world there exists the Regeln für alphabetische Katalogisierung, abbreviated RAK. AACR2 has been translated into many languages, however, for use around the world. AACR2 provides rules for descriptive cataloging only and does not touch upon subject cataloging. Library items that are written in a foreign script are, in some cases, transliterated to the script of the catalog. In the grammatic sort order (used mainly in older catalogs), the most important word of the title is the first sort term. The importance of a word is measured by grammatic rules; for example, the first noun may be defined to be the most important word. In the mechanic sort order, the first word of the title is the first sort term. Most new catalogs use this scheme, but still include a trace of the grammatic sort order: they neglect an article (The, A, etc.) at the beginning of the title. The grammatic sort order has the advantage that often, the most important word of the title is also a good keyword (question three), and it is the word most users remember first when their memory is incomplete. However, it has the disadvantage that many elaborate grammatic rules are needed, so that only expert users may be able to search the catalog without help from a librarian. In some catalogs, person's names are standardized, i. e., the name of the person is always (catalogued and) sorted in a standard form, even if it appears differently in the library material. This standardization is achieved by a process called authority control. An advantage of the authority control is that it is easier to answer question two (which works of some author does the library have?). On the other hand, it may be more difficult to answer question one (does the library have some specific material?) if the material spells the author in a peculiar variant. For the cataloguer, it may incur (too) much work to check whether Smith, J. is Smith, John or Smith, Jack. For some works, even the title can be standardized. The technical term for this is uniform title. For example, translations and reeditions are sometimes sorted under their original title. In many catalogs, parts of the Bible are sorted under the standard name of the book(s) they contain. The plays of William Shakespeare are another frequently cited example of the role played by a uniform title in the library catalog. Some languages know sorting conventions that differ from the language of the catalog. For example, some Dutch catalogs sort IJ as Y. Should an English catalog follow this suit? And should a Dutch catalog sort non-Dutch words the same way? Some titles contain numbers, for example 2001: A Space Odyssey. Should they be sorted as numbers, or spelled out as Two thousand and one? de Balzac, Honoré or Balzac, Honoré de? Ortega y Gasset, José or Gasset, José Ortega y? For a fuller discussion, see collation. In a subject catalog, one has to decide on which classification system to use. The cataloger will select appropriate subject headings for the bibliographic item and a unique classification number (sometimes known as a "call number") which is used not only for identification but also for the purposes of shelving, placing items with similar subjects near one another. The online catalog does not need to be sorted statically; the user can choose author, title, keyword, or systematic order dynamically. Most online catalogs offer a search facility for any word of the title; the goal of the grammatic word order (provide an entry on the word that most users would look for) is reached even better. Many online catalogs allow links between several variants of an author name. So, authors can be found both under the original and the standardized name (if entered properly by the cataloguer). As noted above, the acronym OPAC means Online Public Access Catalog. If you are looking for a book or another item, you can access OPAC from your nearest library and search for it there. If you cannot find a particular book in the catalog, it may be obtained through an interlibrary loan, also known to librarians as I.L.L. Ask the nearest Reference librarian for assistance. Another option is to use a union catalog, in which many libraries have combined their entire holdings into one database. The largest union catalog is OCLC's WorldCat. ↑ What Should Catalogs Do? Retrieved July 6, 2008. ↑ Francoise Micheau, "The Scientific Institutions in the Medieval Near East" in Rushdī Rāshid and Régis Morelon, Encyclopedia of the History of Arabic Science (London: Routledge, 1996), 988-991, 985-1007. ↑ R.F. Strout, "The development of the catalog and cataloging rules," Library Quarterly, Vol.26 No.4, (1956): 254–75. Brenner, M., T. Larsen, and C. Weston. 2006. "Digital Collection Management Through the Library Catalog." INFORMATION TECHNOLOGY AND LIBRARIES. 25, no. 2: 65-77. Chan, Lois Mai. Cataloging and Classification: An Introduction. New York: McGraw-Hill, 1994. Coyle, K. 2007. "The Library Catalog in a 2.0 World." JOURNAL OF ACADEMIC LIBRARIANSHIP. 33, no. 2: 289-291. ———. 2007. "The Library Catalog: Some Possible Futures." JOURNAL OF ACADEMIC LIBRARIANSHIP. 33, no. 3: 414-416. National Center for Preservation Technology and Training (U.S.). Library Catalog. Natchitoches. La: National Park Service, Dept. of the Interior, National Center for Preservation Technology and Training, 2004. RIFIAS Library. [www.letrs.indiana.edu/web/r/rifiasbib Library Catalog] Bloomington: Indiana University, 2000s. Retrieved May 31, 2008. This page was last modified on 5 July 2018, at 18:52.